Discover how you can prevent falls by improving your balance and mobility. 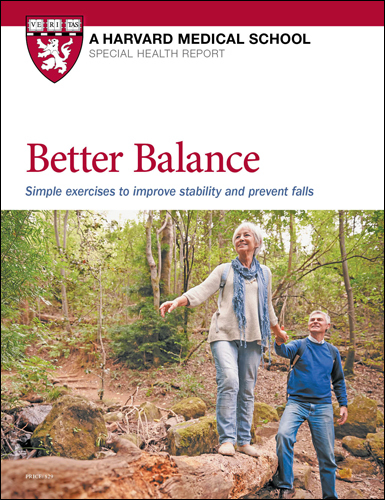 Better Balance: Simple exercises to improve stability and prevent falls gives you step-by-step instructions for easy, effective workouts that will improve posture, increase muscle strength and speed, sharpen reflexes, expand flexibility, and firm your core. You'll also get tips for fall-proofing your home. Poor balance, a persistent problem for millions of Americans, triggers many falls. In young, healthy adults, balance is largely an automatic reflex. However, gradual changes linked to growing older—such as weak or inflexible muscles, slower reflexes, and worsening eyesight—affect the sense of balance. Certain health problems—such as inner ear disorders, neuropathy, and heart rhythm disturbances—may upset balance, too. So can alcohol and many medications. Perhaps it’s not surprising that every year, at least one out of three people over age 65 falls. Shaky balance can spur a downward spiral. Often, people begin moving around less during the day, voluntarily cutting back activities. Confidence dips, muscles essential to balance grow weaker still, and unsteadiness rises in response. So does fear of falling—and falls. For this report, two physicians with expertise in balance and aging join forces with two master trainers to develop safe, effective balance exercises that can help stop this cycle. With practice, almost anyone can achieve better balance. Strong legs and flexible ankles help prevent falls and allow you to catch yourself if you do trip. What’s more, the full blend of recommended activities can help you build better awareness of your body and surroundings, boost your confidence, and tune up your heart and lungs to keep you healthy and independent. A lengthy list of health problems can interfere with balance. This section briefly outlines some of the more common conditions. Many balance problems, such as those caused by arthritis or milder forms of the eye disorders described below, will respond well to the exercises in the workouts. The exercises can also help counteract mild balance impairments due to stroke, Parkinson’s disease, and multiple sclerosis. More severe balance problems that are caused by those conditions are beyond the scope of this report. Ear infections, allergies, head injuries, or problems with blood circulation may temporarily or permanently affect the vestibular system in the inner ear. That sparks trouble with balance, dizziness, and vertigo (the sickening sensation that you or your surroundings are spinning). Treatment varies depending on the disorder. If dizziness and nausea are persistent, vestibular rehabilitation (balance retraining therapy) may be recommended. A trained vestibular rehabilitation therapist can recommend a treatment plan combining certain head, body, and eye exercises, which may help ease these symptoms. Talk to your doctor about this. Three common vestibular disorders pose particular problems with balance. Benign paroxysmal positional vertigo (BPPV). Sometimes the tiny stones called canaliths tumble out of the utricle and into a semicircular canal (see “Vestibular system,” page 3). The stones prevent the cupula and the sensory hair cells inside it from tilting properly, so that conflicting messages about the position of your head are sent to the brain. Turning your head to catch a glimpse behind you or rolling over in bed can cause the room-spinning sensation of vertigo. Possible causes of BPPV include head injury and aging. The Epley maneuver, a series of simple movements done while sitting upright, lying down, and turning your head to one side may help shift errant canaliths out of the semicircular canal. This canalith repositioning procedure must be guided by a trained clinician. Labyrinthitis. When the labyrinth—the inner-ear structure containing the three semicircular canals, along with the utricle and saccule (see “Vestibular system,” page 3)—is infected or swollen, temporary dizziness and loss of balance may occur. An upper respiratory tract ailment like tonsillitis, sinusitis, a cold, or an ear infection is often the culprit. Allergies, smoking, alcohol use, stress, and fatigue can increase the risk of developing labyrinthitis. Washing your hands often and getting an annual flu shot can help stave off certain infections that contribute to it. Ménière’s disease. This condition, which typically strikes men and women between 20 and 50 years of age, affects both hearing and balance. Endolymph—the thick fluid inside the inner ear builds up to the point where it ruptures the membranes that hold it, damaging the surrounding sensory cells. Spells of Ménière’s disease come and go, lasting minutes or hours, and triggering hearing loss, vertigo, and tinnitus (persistent ringing or other noise in the ears). Sometimes this disorder stops on its own; in other cases, sufferers need medication or surgery for relief. Cutting down on salt (sodium) in your diet and limiting alcohol or caffeine can lessen the dizziness. Sometimes diuretic drugs help. Eye disorders can blur sight or even punch holes in your field of vision, leading to balance problems. Four eye disorders—cataracts, glaucoma, diabetic retinopathy, and age-related macular degeneration—are common culprits. Cataracts, which make your vision cloudy or blurry, are the most common of these, but they can easily be corrected with surgery. Glaucoma is also relatively easy to treat with eye drops or surgery. Initially, it diminishes peripheral vision. If left untreated, it leads to increasing blindness. In glaucoma’s early stages, you may not notice any changes in your vision, so it is important to get regular eye exams as you age. Diabetic retinopathy can lead to blurred central vision and spots and floaters that create holes in the field of vision. Macular degeneration also affects your central vision before spreading outward and is a leading cause of blindness. Stiff, sore joints hamper movement. If your ankles or knees are arthritic, for example, it’s hard to bend them, which affects your ability to balance and react when you trip. If your neck is stiff, your range of motion—how far you can move in any direction—is limited, so that you tend to move your upper body to look behind you. This can upset your balance, too. Recent data indicate that people with knee and hip osteoarthritis fall 25% more often than those without arthritis, and up to 50% of people with arthritis fall annually. The greater the number of joints affected, the bigger the risk. Arthritis in the joints of the spine can also be a problem. If the arthritis becomes advanced, the space within the spinal column may narrow, as may the spaces between the bones, a condition known as spinal stenosis that can cause pain, tingling, and numbness in the arms, legs, and back. You may keep your body stiff or adopt an awkward posture to avoid the pain, which can affect your balance, and a lack of exercise due to pain may lead to deconditioning, weak muscles, and ultimately falls. and prickling sensations called paresthesias. arms—malfunction first. Over 100 kinds of neuropathy have been identified. These ailments may be short-lived, lasting only until damaged nerves heal, or progress slowly and permanently. A change in the speed or rhythm of the heartbeat called an arrhythmia may interfere with blood supply to the brain, spurring sudden weakness or dizziness that affects balance, or more serious problems like fainting or a heart attack. Having to get up in the middle of the night to urinate because of an overactive bladder may lead to falls or tripping over objects in the dark. Avoiding liquids and relieving yourself before bedtime may help to reduce the need to urinate overnight. Although many people are hesitant to speak about incontinence, you should talk with your doctor. In 70% of cases, incontinence can be cured or significantly improved with appropriate help, ranging from pelvic floor physical therapy to medications or surgery. Strokes occur when a blocked blood vessel suddenly interrupts the flow of oxygen and nutrients to part of the brain, or, less often, when a blood vessel bursts inside the brain. The compromised brain cells die off, causing many serious problems that can affect balance, including weakness, numbness, trouble seeing, trouble walking, dizziness, and loss of coordination. Often, these physical deficits are confined to one side of the body. A stroke can wreak havoc on important mental functions that play into balance, including attention, working memory, and decision making. 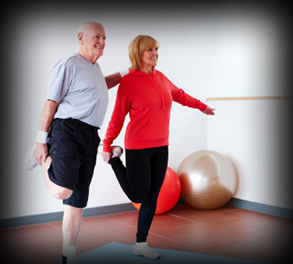 Stroke rehabilitation can be very effective in allowing individuals to regain their balance. Rather than repairing the injured brain tissue and nerves, however, rehab exercises that target motor skills and mobility help to reorganize and optimize the intact elements of the balance control system to maximize its function after the stroke injury. Cells in certain areas of the brain produce dopamine, a naturally occurring neurotransmitter that regulates movement, among other tasks. The loss of these brain cells causes Parkinson’s disease, which affects the system of motor nerves throughout the body. This condition impairs balance in a variety of ways: through tremors in the legs and other parts of the body, rigidity of the limbs and trunk, slowness of movement called bradykinesia, and direct hindrance of systems affecting balance and coordination. Difficulty walking occurs as the disease progresses. General aerobic and strength training exercises are helpful, and there is always room for improvement. In addition, a form of non-contact boxing called Rock Steady Boxing (https://rocksteadyboxing.org/parkinsons-boxingclasses) has been found to improve balance, agility, speed, and strength in people with Parkinson’s. This unpredictable central nervous system condition disrupts communication between the brain and the body. It often causes muscle weakness and interferes with balance and coordination, sometimes making walking—or even standing—difficult or impossible. As multiple sclerosis advances, it can cause partial or complete paralysis. A variety of other possible symptoms may interfere with balance, too: dizziness, tremors, trouble with concentration and attention, and sensations of pain, numbness, prickling, or “pins and needles.” As with Parkinson’s, people with multiple sclerosis can often benefit from general aerobic and strength training exercises, performed at whatever level they are capable of doing safely. The ability to stand and walk is not just a simple, automatic motor function driven by your limbs and muscles, but rather a complex task that requires cognitive input. As such, declining mental and cognitive function can increase the risk for balance issues and falls because of impairments in attention, reaction time, decision making, detection of postural issues, and short-term memory. Yoga and tai chi can be helpful in preserving balance in people with dementia and cognitive impairment.